This pattern is an easy to sew, light and airy, basic yoke dress design, perfect for beach portraits and summer dresses. The neckline and armholes are finished with a bias binding facing. Shell designs are included for the shell shadow work variation, along with suggestions for DMC colors for the embroidery. A short puffed sleeve pattern is also included to make this pattern more versatile! It contains 8 pages of detailed instructions with photographs to assist you in having fun sewing this summer dress. 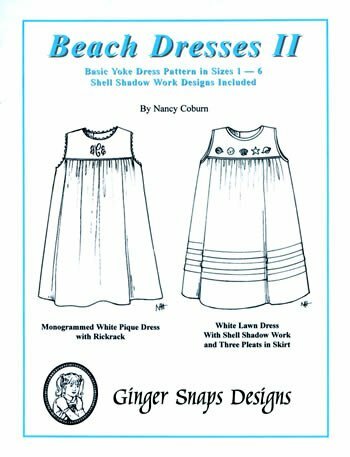 Nancy Coburn also includes helpful tips on dress designs for beach portraits.